FILL OR BUST is a great family game that any number can play. Compact packaging makes it easy to take along when camping or traveling. 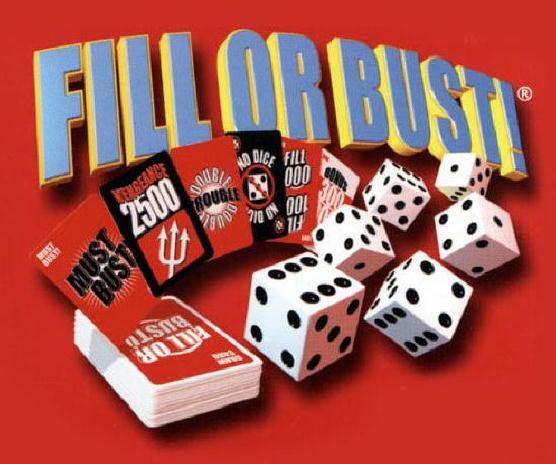 FILL OR BUST will test your luck and strategy. You can play for half-an-hour or half-a-day. Team play, tournament play, and optional rules are included. FILL OR BUST contains 6 dice & 54 draw cards, plus instructions for playing. FAST FUN & EXCITEMENT for two or more players. Contains 6 dice & 54 draw cards plus instructions. For 2 or more players.